The other day, Grits reported on the new elements Texas law enforcement agencies must begin including as part of their racial profiling data, starting with reports that will be released March 1, 2019. Now, let's discuss some of the implications for publishing this new data. There's a fundamental problem with trying to use racial profiling data to allege discrimination at traffic stops from a statistical perspective, because it's impossible to tell with certainty what denominator to use. Not everyone ticketed by a given agency is from that jurisdiction. So, for example, data from Austin PD's traffic tickets on the day of a UT Longhorn football game might capture drivers from all over the state. Or, a rural jurisdiction with an interstate running through it may ticket out-of-towners more often than locals. As it turns out, this is an insurmountable data problem - there will always be something to nitpick, no matter which denominator one chooses, because of limitations in the data. Searches, however, are a different story. We know the denominator there - people who are searched are a subset of the people stopped. Moreover, since we can isolate "consent" searches, where an officer must ask permission to search because they don't have probable cause, it's possible to drill down to measure outcomes (i.e., whether police found contraband) within the narrow category of searches where officers are exercising discretion. Still, a key piece of data was heretofore missing: The results of the search! As of next year, all agencies will be required to report how often those searches find contraband, and what was found (in broad categories). Starting next year, we'll find out how often these consent searches are productive and whether the results are racially disproportional. Where that data has been available, frequently the result is that black folks were more likely to be searched but officers found contraband more often searching white drivers. Austin PD, for example, implemented a requirement to obtain written or recorded consent to search after gathering data on contraband and discovering, in 2003, that police were seeking consent searches from black drivers more than five times as often as whites but were finding contraband on white drivers twice as often as black drivers who were searched. 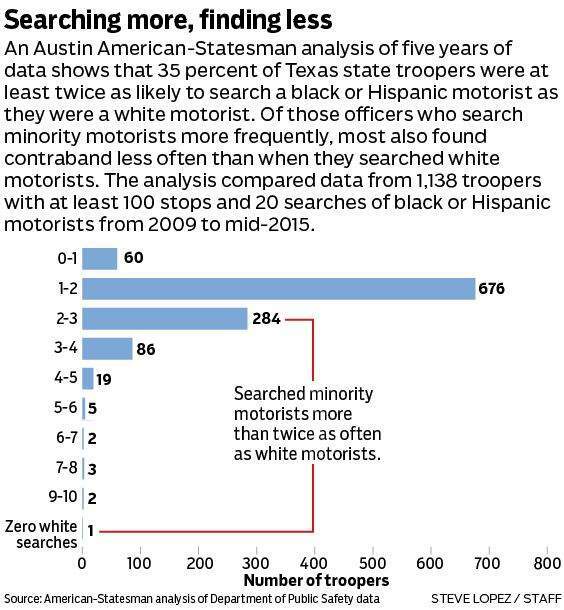 A similar pattern was found in 2015 when DPS' racial profiling data was analyzed by a national expert, as reported in this excellent Austin Statesman feature. Texas agencies performing traffic stops are already required to record when they search vehicles based on "consent" rather than probable cause. Some agencies use consent searches infrequently; others use them all the time. Knowing the outcomes will complete the loop, letting agencies truly measure discriminatory practices. 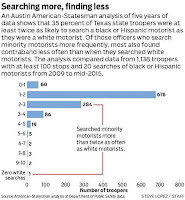 But these data are useful for more than just proving racial discrimination: They provide one of the only data-based windows we have into Texas traffic stops, and combined with the statewide dashcam rollout that was part of the original 2001 bill, give us a window in the 21st century into the day-to-day workings of police practices that was simply unavailable to prior generations. It's rather amazing to Grits that we know as much as we do about traffic stops compared to what was available when I began this work a quarter century ago. These additional data basically complete the dataset we were trying to achieve when the bill first passed in 2001. Dallas state Sen. Royce West carried the bill; at the time your correspondent was Police Accountability Project Director for the ACLU of Texas, and worked hand-in-glove with then-E.D. Will Harrell on the legislation. Politics being the art of compromise, we couldn't convince the Legislature back then to include data which would allow such precise measurements of discriminatory practices. The police unions couldn't stop the entire bill, but they could and did stop that. Sixteen years later, though, the Sandra Bland Act picked up that spare, in bowling parlance, and henceforth we'll be able to measure over-aggressive and discriminatory search practices at traffic stops much more easily. After Sandra Bland's untimely death, a bipartisan push emerged to stop law enforcement from arresting people for Class C misdemeanors where the maximum punishment is a fine, not jail time. Last month, a call to eliminate such arrests was included in both the Republican and Democratic Texas state party platforms. Two of those - traffic laws and city ordinances - are Class C misdemeanors, so that means, during session, we'll get first-of-its-kind new information for agencies statewide that's directly relevant to what by then will surely be pending legislation. When the Texas Criminal Justice Coalition last year analyzed four months of data from Harris County, it turned out 11 percent of all arrests were for Class C misdemeanor violations. There is reason to believe that that's a higher number than we may find elsewhere, because of Harris County DA policies where prosecutors must pre-approve Class B arrests but not Class Cs. But until we see the data, there's no way to know whether 11 percent is really an outlier, and by how much. Grits is genuinely curious; I can't wait to find out! Some jurisdictions conduct fewer consent searches but use arrest on a Class C as a way to complete searches without consent. In Austin, for example, APD policy specifically allows search incident to arrest as an allowable reason for a Class C arrest. So this new data will also allow researchers to analyze whether Class C arrests are also disproportionately aimed at black drivers in order to conduct searches that were not consent based. Finally, the new requirement to record how often traffic stops include police use of force that results in bodily injury provides data on an obscure, darkened corner of policing that no one thought about much before the advent of police dash-and-body cams and, more recently, the public's own cell-phone videos. Now we'll get department level data on how often that happens, and agencies themselves will be able to drill down to analyze trends at the level of the individual officer. You cannot manage what you can't measure, so Grits welcomes these first steps at understanding the scope of police violence at traffic stops in Texas. Unlike the data on searches, discussed above, new force data in the report arrives in an essentially embryonic stage. I think we're going to learn a lot, and predict the new force data will raise more questions when it comes out. I'm wondering if a quota system might lower the incidence of Blacks being targeted by the police. Seems like Grits finds lots of criticism about all things corrections, but offers few alternatives or solutions. That's the hard part of course. Actually, the new data collection IMPLEMENTS suggestions I've made for years, fwiw. Not sure what you're talking about, Dirk.